Expedia has some Positano travel packages ready and waiting. Bundling your flights and accommodations is one of the easiest ways to save money on your adventure. With more than 400 partner airlines and 321 000 properties worldwide for you to choose from on our comprehensive database, you'll be heading off on your next holiday in no time! If you change your plans, we will honour your cancellation request on almost all reservations with no added fees. Preparing to take off on your Positano holiday? Can't work out what things to put on your travel itinerary? Don't stress — we'll give you some pointers. You'll never have to worry about a boring moment in this dynamic city. Emerald Grotto and Church of Santa Maria Assunta will be sure to keep you occupied. The Paper Mill Museum and the Ancient Arsenals of the Amalfi Republic are a few more terrific attractions that are worth a peek. Of all the roads you choose in life, make sure at least a few are made of dirt! So slip into those boots, top up your water bottle and enjoy a walk through Sentiero degli Dei. Adventurers in this destination have a great range of options. There is something soothing about the murmuring swell at the seashore. Unfold a picnic chair, stretch out and observe the fluctuating moods of the ocean at Spiaggia Grande. Still have time on your hands? There's nothing more relaxing than the sound of ocean waves breaking along the shore. Roll out a picnic rug, lie back and let your soul be soothed at Marina di Praia. Holidays are pretty great to begin with. But diving into the exciting experiences on offer definitely makes them better! For a complete range of activities, check out the Positano things to do page. You can expect a wide range of accommodations when you head to Positano. With no less than 206 properties on offer, it won't be too difficult booking a nice place for your next cheap holiday or luxury getaway. If you're someone that can't sleep a wink unless they've got 1000 thread count sheets, why not snuggle down in luxury at the Le Sirenuse (Via Cristoforo Colombo 30) or the Casa Angelina Lifestyle Hotel (Via G Capriglione 147)? Alternatively, if you're travelling on a shoestring, the Palazzo Margherita Positano (Via Guglielmo Marconi 45) and the Villa Fiorentino (Via Guglielmo Marconi 150) might be a better fit. The airport probably isn't going to be the most entertaining part of your holiday, but there's nothing like the thrilling feeling of knowing that your well-deserved trip to Positano is just a plane trip away! Once you disembark at Naples International Airport (NAP), you'll be 20 miles (32 km) from the heart of town. A 12th-century statue, ancient bas-relief and stunning architecture make this church one of Positano’s most popular attractions. 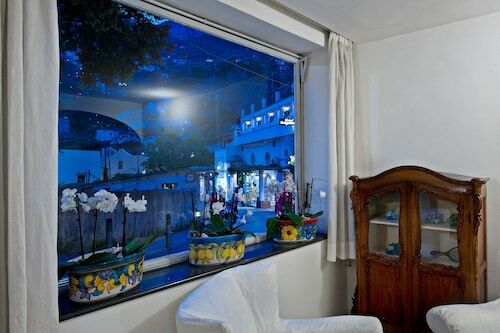 Located in Positano City Centre, this hotel is steps from Piazza dei Mulini and Church of Santa Maria Assunta. Positano Tourist Office and Spiaggia Grande are also within 10 minutes. 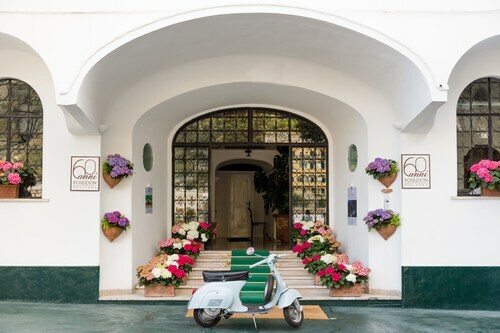 Situated in the historical district, this hotel is within a 15-minute walk of Positano Town Hall, Church of Santa Maria Assunta, and Spiaggia Grande. Positano Tourist Office and Positano Ferry are also within 15 minutes. This family-friendly Positano hotel is located on the waterfront, within a 10-minute walk of Spiaggia Grande and Piazza dei Mulini. Church of Santa Maria Assunta and Positano Tourist Office are also within 15 minutes. 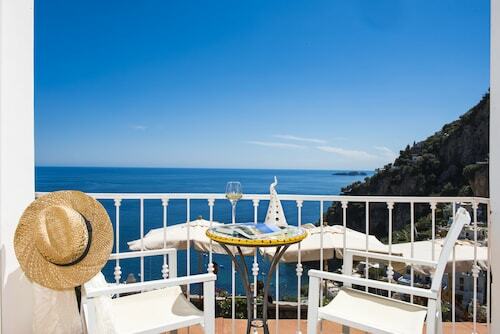 Situated by the sea, this hotel is within a 15-minute walk of Positano Town Hall, Church of Santa Maria Assunta, and Positano Tourist Office. Spiaggia Grande and Positano Ferry are also within 15 minutes. Located 60 km from Naples on the Amalfi Coast, Hotel Villa Franca is within a 10-minute walk of both Spiaggia Grande and Spiaggia Fornillo. The Church of Santa Maria Assunta is less than 1 km away. 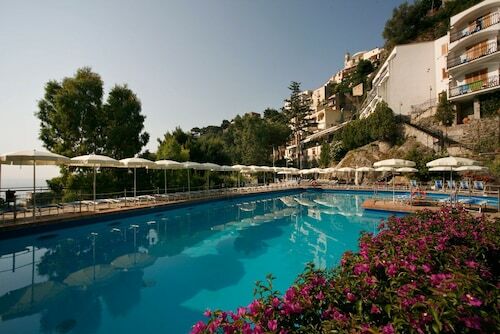 Situated in Positano, this hotel is within a 10-minute walk of Positano Town Hall and Fornillo Beach. Church of Santa Maria Assunta and Positano Tourist Office are also within 15 minutes. 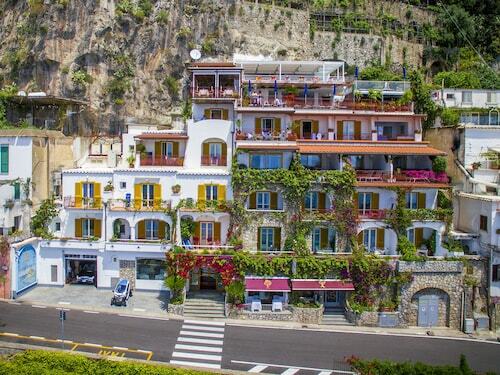 Nestled on the beach, this Laurito hotel is within 2 mi (3 km) of Spiaggia Grande, Fornillo Beach, and Positano Ferry. Piazza dei Mulini and Church of Santa Maria Assunta are also within 2 mi (3 km). 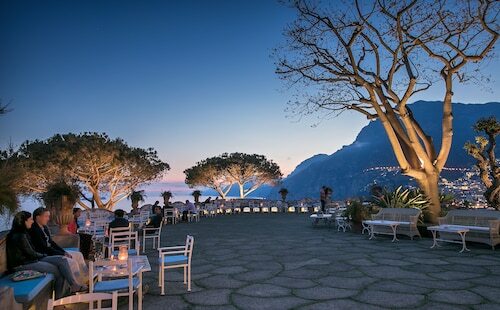 Hotel Poseidon is nestled amid hills on the Amalfi Coast, overlooking Positano harbor. Guests can walk 10 minutes through the town center, past charming shops and the towering Byzantine church, to glamorous Spiaggia Grande beach - where they can sunbathe or catch a water taxi to explore the coast. Tue., 4 Feb. - Tue., 3 Mar. Thu., 24 Oct. - Wed., 30 Oct. 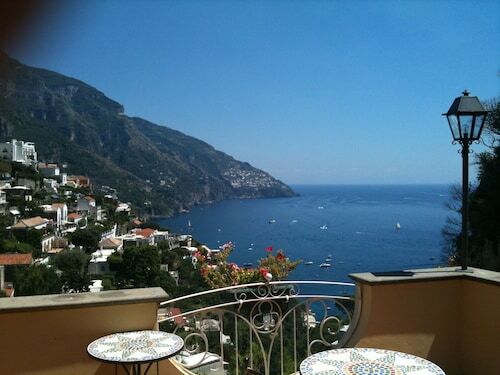 Looking for Flights, Hotels, Car Hire and Holiday Rentals in Positano?